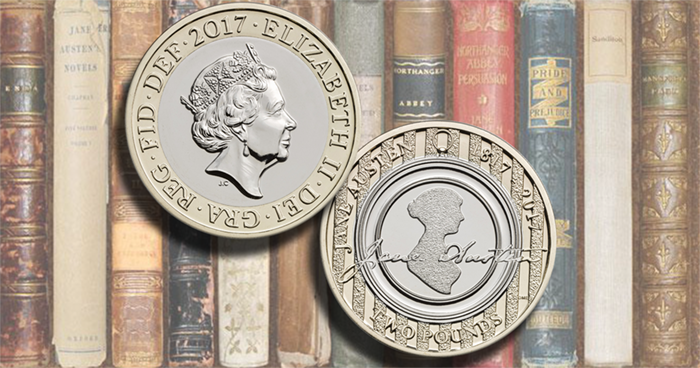 The Royal Mint have launched (on January 1) a new £2 coin that pays homage to one of the country’s most celebrated 19th-century writers, Jane Austen (1775–1817), whose literary works during her life quintessentially captured both the gentility and the hardships of 18th-/19th-century life in the English countryside. The new coin remembers the 200th anniversary of the author’s death. Also during 2017, a portrait of the author will be introduced on the Bank of England’s new £10 polymer banknote, scheduled to be introduced into circulation in the spring. The coin is designed by Dominique Evans, whose depiction includes a well-known Regency-style silhouette of the author facing to the right by an unknown artist, thought to have been created circa 1810–1815. 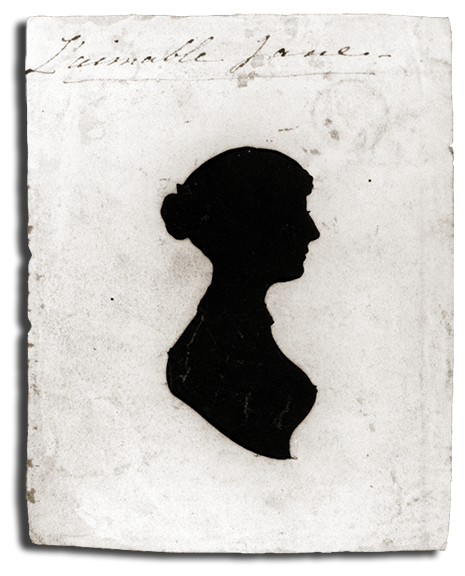 The original work was found pasted into a copy of Mansfield Park, published in 1814 with the words “L’aimable Jane” (“the amiable Jane”) written above the silhouette (the page is shown below the chart). The ownership of the book was never wholly ascertained. The original work is now on display at the National Portrait Gallery in London. The silhouette is surrounded by a miniature frame design, inspired by the era when the custom of exchanging miniature portraits with close friends, family, and—during courtship—admirers was prevalent. 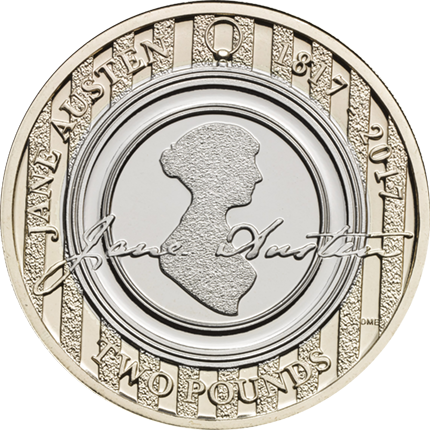 The text JANE AUSTEN 1817–2017 is placed above the portrait, with the denomination TWO POUNDS below. Across the silhouette is a facsimile signature of Austen. 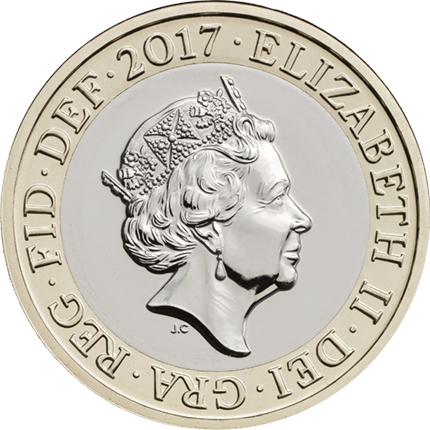 The obverse includes the date of issue, 2017, and the fifth effigy of HM Queen Elizabeth II, which was designed by Jody Clark and has been in use since 2015. All versions of the commemorative coin include the incused edge lettering THERE IS NO DOING WITHOUT MONEY (a quote from her posthumously published novel Northanger Abbey).The Brilliant Uncirculated coin is encased in a colorful presentation blister-pack folder. The silver Proof editions with selective gold plating are issued in both standard specifications and piedfort strikes, and each is housed in a custom presentation case with certificate of authenticity. The gold Proof is housed in a custom-crafted wood case, also with certificate of authenticity. For more information on these and other coins offered by the Royal Mint, please visit their website. Jane Austen was the youngest of two daughters of George Austen (a rector in the Parish of Steventon, Hampshire) and Cassandra Leigh (of the prominent and titled Leigh family). Austen’s six brothers were all older than she with the exception of Charles John, who was four years younger. An older brother, Edward, was adopted by a wealthy relative of George Austen when he was 12 years old. Thomas and Catherine Knight, who were without any children, had become close to Edward. Austen was born into what would have been considered a middle-class family with financially modest means, owing to her father’s being a member of the clergy and their need to rely on the generosity of wealthier relatives—a predicament not missed upon by Jane during her earlier years. Austen received a very comprehensive education, something unusual for a young woman in the latter part of the 18th century. She eventually earned the opportunity to study at Oxford at the age of 8 years along with her elder sister, Cassandra. The opportunity was, however, short-lived as both girls caught typhus and had to be sent home with immediate effect. Austen and her sister were then taught at home until both were sent to boarding school in Reading when Jane was 10 years old. This opportunity was also short-lived owing to the high school fees, which proved to be too much for the family to pay. From then on, Jane returned to her family, and she never ventured far from them for the rest of her life. Her further education was overseen by her father, a teacher in his own right, who instructed her in the same manner as he did her brothers, making little distinction between his sons or daughters. It was during this time that Jane showed an interest in writing. She was often observed writing down her feelings, thoughts, and opinions on all matters of the day, and she turned these musings into short stories for the amusement of her immediate and extended family, who visited frequently. Austen would over her earlier years write an extensive number of stories, musical works, and artistic pieces—29 works in all, which she would later compile into a three-volume body of work entitled Juvenilia. In total, the compilation would preserve more than 90,000 words written between 1787 and 1793, while Austen was still not yet 20 years of age. At the time of her 20th birthday, in 1795, it was suggested by Austen herself to her sister that she was being courted by a young man who was known to the family and had returned to Steventon from University. He was Thomas Langlois Lefroy (1776–1869), an eventual Lord Chief Justice of Ireland, and it was intimated that Jane was very seriously thinking of accepting his proposal. She later refused it, telling Lefroy that she no longer had any affection for her friend, after a courtship lasting just one year. Ultimately, Austen never married, suggesting that future suitors never could compare to Lefroy in her estimation. It was later thought that both families were not in favor of a union between the two, as neither had the financial means to set up their lives together—Lefroy being dependent on a wealthy relative who wished for Lefroy to marry a woman of means in London, where Lefroy eventually lived. In December 1802 Austen did, however, accept a proposal of marriage—the only one known about—from the brother of a family friend, in the belief that this marriage would accord her financial freedom and the ability to offer her parents and sister a comfortable life. However, the morning after accepting the proposal from Harris Bigg-Wither, she thought better of her decision and withdrew her acceptance. After completion of her first serious novel, entitled Elinor and Marianne (believed to be during the year 1796), Austen went on to complete her second work, entitled First Impressions. Elinor and Marianne went on to be known to the literary world as Sense and Sensibility, which would become Austen’s first published novel—anonymously attributed to the authorship of “A Lady.” The novel, which was published in 1811, fifteen years after its completion, was well received indeed, selling out the entire first print run of just 750 copies—a considerable number at the time—necessitating a second run by 1813. The book finally made its author a successful writer. Her second work, renamed Pride and Prejudice, was actually turned down by a publisher in London as early as 1797. Her father had written to an editor and submitted the manuscript, which was returned as having been declined. Pride and Prejudice was ultimately published in 1813. It was not the same financial success for Austen as her first novel, as she had sold the entire rights of her second novel to the publisher instead of agreeing upon a commission-type remuneration as with Sense and Sensibility. The novel proved to be a great success, with three eventual print runs by 1817. Austen embarked upon her third published work, Mansfield Park, which is said to have been for the most part ignored by reviewers yet was nonetheless popular with her ardent fans. Thought to be partly autobiographical, the novel managed to garnish for Austen a greater amount of money than either of her previous works. Austen’s work was now being published under the pseudonym of “from the Author of Sense and Sensibility and Pride and Prejudice,” still anonymously producing some of the literary world’s most popular stories. With the upcoming publication of her fourth novel, Emma, which was published in 1815, Jane had become aware of the admiration of one of the country’s more well-known readers: the Prince-Regent George, son and heir of King George III, who had expressed his admiration for the author of these new works. It had been told to her by the prince’s personal librarian that the prince-regent had a copy of all of her novels in each of his residences, and that he had expressed his wish to meet the author. Although Austen was not particularly fond of the prince—mostly due to his well-noted life of drinking and womanizing—she did not refuse his request and met him at his London home. Although it had been suggested to Austen by the prince’s librarian that she dedicate her next published novel to Prince George, she declined—instead, she wrote a more satirical work entitled Plan of a Novel, according to Hints from Various Quarters. Although this work was not published for many more years in its entirety, it was meant to parody the royal librarian perfectly. By early 1816 Austen had begun to feel unwell, though she herself ignored her own signs of poor health. Initially, it was thought that the death of her wealthy uncle, who had disinherited his relatives, was the cause for Austen’s illness. Ultimately, however, the signs of what would later be termed Addison’s Disease was found to be the cause of her decline and deterioration. She continued to write during her illness, intent on completing her latest work, The Elliots, which she did—rewriting the last two chapters in August that same year since she was unhappy with its ending. By the beginning of 1817, Austen embarked on yet another body of work, this one entitled The Brothers. She had completed 12 chapters before finally putting down her pen on March 18—a date she recorded and made note of. The work went unfinished, as Jane Austen died at her home on July 18, 1817, at the age of 41. She was buried in Winchester Cathedral by arrangement of her brother Henry, a one-time banker who became a clergyman the year before his sister’s death. It was Henry who, along with their sister, Cassandra, arranged for the publication of Austen’s last completed works. When Persuasion and Northanger Abbey were published together later that year, it was the first time the public knew actual identity of the author of these and previous novels—Jane Austen.